I’ve written hundreds of video game reviews over the years, but there’s no game that makes me want to spill ink more than Dark Souls. When I thought I was going to die of cancer, when my legs were literally paralyzed from a tumor in my spine, I leaned into Dark Souls. I wanted to see something intrinsically beautiful and simultaneously grotesque. At a time when my world was radiation, nausea, and trips to the hospital, Dark Souls gave me an experience that could bring my manic and hazy waking moments into razor focus. I can talk about architecture, symbolism, lore, cycles of mythology, unreliable narration, reflection of self, and the balance of beauty and brutality in Dark Souls for hours. 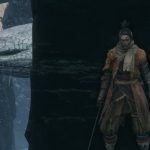 So I thought, why not do that for Sekiro: Shadows Die Twice? Why not come back to a Hidetaka Miyazaki world, but instead of banging out a seven-hundred word hot take, I would linger through the experience. Why not try to do what one of my critical mentors failed to do when he engaged with Dark Souls and wrote it off as waste of time; I want to bring you, whatever your relationship to the Soulsborne games, into my experience. I invite you to become a witness to wonder, transformation, frustration, and perhaps even futility in something that will blend a review and journal into a single experimental experience. My first dive into Sekiro lasted a little more than an hour. At once, it felt like coming home, but also coming home to find that a bunch of friends in your living room. 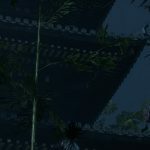 The introduction into Sekiro’s vision of Sengoku-era Japan is built on the touchstones of anime-inspired popular culture. It is a game that reminds players that its default language is Japanese, and then wastes no time feeling like a story running diagonal to 1993’s Ninja Scroll. Playing as the Shinobi called Wolf, who I’ll refer to as Okami to keep with the spirit of the story’s original language, feels like inhabiting an ancestor of Solid Snake. And unlike Souls characters of days past, Okami speaks. He’s not a silent persona of the player forged through character creation. He has a quest, a call to action, and then a crushing defeat that only adds to the magic that lurks at the edges of this world. Simultaneously, the opaqueness of Dark Souls is now a character-driven tease. The Divine Heir, the son of Okami’s seemingly dead lord and master, speaks with the wayward Shinobi about his lost memories and hidden past. Dark Souls asked players to take the game on faith, to trust the experience to guide them through layers of story. Sekiro, despite an opening movement that revels in bloodshed and sword play, has an ounce of coyness about it. It doesn’t ask for trust. It invites the player to trust it through a traditional approach to storytelling. When Okami loses his arm to the story’s antagonist, signaling the beginning of the game, proper, the limb is replaced with a modular prosthetic. 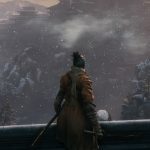 Once again Sekiro is appearing to make a nod to another of its inspirations. Okami’s arm, with its grappling hook and shuriken, draws parallels to Guts, the one armed swordsman in Kentaro Miura’s Berserk. Yet this is also where the decision to make Okami his own character, rather than a character created by the player, makes the most sense to me. I don’t know that I want to see my own image as Guts or Jubei Kibagami. They are characters I want to explore, but not become in the same way that I crafted myself into my Guardian in Destiny 2. I want a game like this to give me permission to explore the singularity of purpose that comes with those characters without seeing it written on my own face. Then there is the beauty of the swordplay. 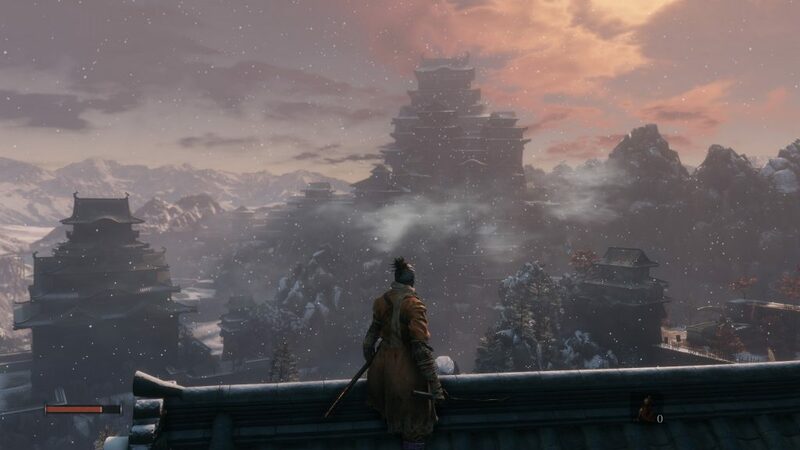 In a game that drips with the aesthetic of a world on the edge of decay – we learn one clan has at once seized power in a coup and then made a mess of the world – Sekiro’s swordplay completes the feeling of being part of something familiar and at once entirely new. True to the Dark Souls tradition, every minion reminds the player that they are not mighty. No random goon with a sword should be treated as anything less than a genuine threat. Similarly, a magic gourd replaces the ubiquitous flask of the undead for perpetual heals, and statues of the Buddah supplant bonfires as places of refuge. The more things change, the more they stay the same. 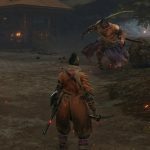 The divergence, the gorgeous transformation from Dark Souls and dispatching goons with a mastery of timing, is that every fight in Sekiro has the intensity of a duel in a Kurosawa film. Each battle is a showdown, a struggle to overcome a foe’s posture and balance. I have slipped into a world that has unified Yojimbo, Ninja Scroll, and Berserk into a single offering, and I want more.